UPDATED: Sat., Oct. 27, 2018, 9:46 p.m.
After striking early and often the prevous three games, the Whitworth offense didn’t look like itself early on Saturday against Pacific. It turned the ball over twice. Junior quarterback Leif Ericksen, who came in as the most efficient passer in the Northwest Conference, completed fewer than half his passing attempts. And the Pirates’ running game just wasn’t clicking. But Whitworth’s defense did enough in the first half to keep the game close, and after the half the Pirates looked much more like themselves. Whitworth beat Pacific 37-19 at the Pine Bowl, pushing its record to 7-0 for the first time in 12 years and setting up a chance to clinch the conference title at home next week. Whitworth played a lot of zone defense in the first half, and Boxers senior quarterback JT Greenough carved through it. In the first half he was 20 of 25 for 193 yards and two touchdowns. One went to sophomore receiver Ty Hargis, who ended the game with 17 catches for 186 yards. Two Whitworth fumbles gave the Boxers (4-4, 3-2) short fields, and that helped Pacific build a 16-7 lead midway through the second quarter. By then, all that the Whitworth offense had managed was Ericksen’s 72-yard touchdown dash on a zone-read. But Pacific also squandered opportunities. It missed three short field goals, had an extra point blocked, and failed to convert key red-zone opportunities into touchdowns. Whitworth managed to tie the score before the half. Cody McDonald drilled a 32-yard field goal to make it 16-10. On the Pirates’ next drive, senior Brett Moser got behind the defense and Ericksen found him for a 36-yard touchdown. The Boxers blocked the point-after attempt, and so the score was knotted at 16. But after halftime, the Pirates switched to a Cover 1 defense. That adjustment proved pivotal. In the second half, Greenough was still relatively efficient (17 of 24 for 131 yards), but with his No. 1 receiver not getting open, he held the ball longer and was sacked six times. The Boxers couldn’t find a lasting rhythm. Late in the third, a short punt gave Whitworth the ball at Pacific’s 39, the first time it started a drive on that side of the 50. Seven plays into the drive, Ericksen connected with senior Garrett McKay for a 10-yard touchdown to break the tie and make it 23-16. Pacific answered with a field goal, but Brayden Corona – staring into the sun on seemingly every kickoff return – followed his blocks all the way to the Pacific 19. After a penalty, Tariq Ellis ran up the middle for a 28-yard touchdown to stretch the lead to 30-19. Later, Pirates freshman cornerback Colten Chelin stepped in front of an out route at the 21-yard line and took it in for his first career touchdown, making it 37-19. 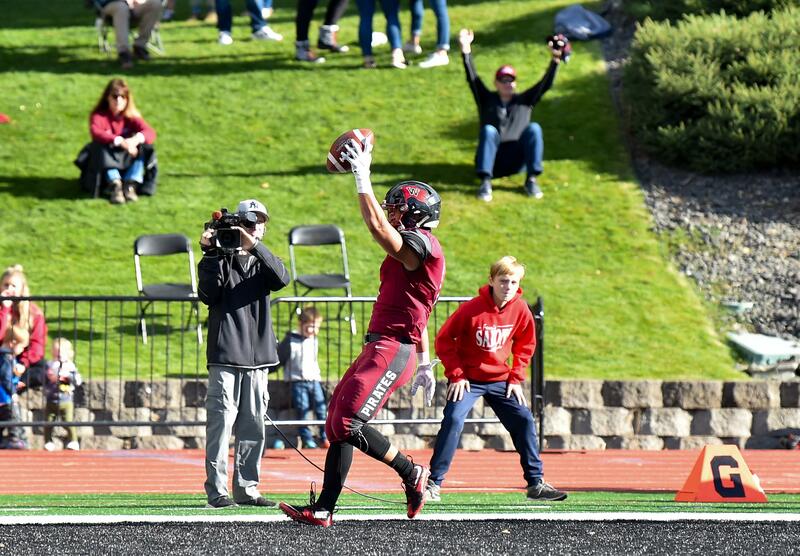 If Whitworth beats Lewis & Clark (2-5, 1-4) next week at the Pine Bowl, it will clinch the NWC title and a spot in the playoffs for the first time since 2015. The Pirates end the regular season at Willamette (1-6, 0-5) the following Saturday. Published: Oct. 27, 2018, 5:49 p.m. Updated: Oct. 27, 2018, 9:46 p.m.